Go back to basics with sleep-in rollers. Nowadays we have so many newfangled electronic styling tools promising us the world that we often forget that sometimes the best methods are the simplest. Whilst you might resent shelling out lots of money for curling tongs and blow dryers for curl and volume and then not using them, we suggest that you down tools and instead opt for old-fashioned rollers. Whilst rollers are no-where near as popular as they used to be in bygone eras – when women used to be seen popping to the shops sporting rollers and a hair net – recent months have seen a number of women in search of bounce go back to this simple, quick and cheap method. Velcro sleep-in rollers in particular have become extremely popular after reality TV shows such as Desperate Scousewives and The Only Way is Essex have featured popular cast members wearing them to achieve their signature big and healthy looking curls for a night out. 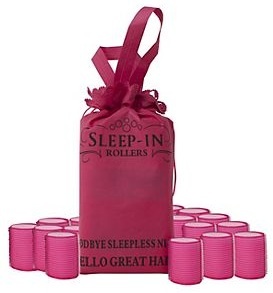 We love Sleep-In Rollers (£19.59 for 20), which come in a cute pink bag so you can carry them around should you wish to. The idea of sleep-in rollers is that you pop them into your hair before slipping into bed, so that you can wake up in the morning and ‘et voilà’, beautiful low maintenance hair. Unlike other rollers that are hollow in the centre, these have a squishy foam middle so that you can comfortably sleep with them in. Whilst of course they aren’t as comfortable as going to sleep without them in your hair, they certainly aren’t intrusive or unbearable and after a few wears you’ll become more used to how they feel in your hair. Wash and blow-dry your hair, leaving it only very slightly damp if you want extra curl. Part your hair into sections using a comb and sectioning clips. Start at the front of your head and work your way backwards. Wrap the hair around the roller from front to back in order to lift the hair and create volume from the root. If you have a fringe, roller the hair in the opposite direction. Secure each roller firmly into position using kirby grips. When you wake up in the morning, remove the rollers starting from the back and gently brush. If your hair still feels damp before removal, because the rollers are free from metal or plastic you can blast them with the hairdryer without burning your hair to speed up the process or for added bounce. Spritz the hair with a good hairspray that still allows for movement in the hair. Space-age beauty buys In need of a helping hand?